Home #ADDICTIVE Drop Free – Ready for an insanely-addictive platformer? Drop Free – Ready for an insanely-addictive platformer? Drop, Tap, Jump – How hard could it be? The UH Development team wanted to create a simple yet addictive game that kept users coming back. We had an idea, so we developed and then published hoping the world would enjoy what we had to offer. Our motto is simple, revolutionize the game app market, make them want more. That’s exactly what Drop Free is about. Help a character jump and avoid all obstacles in a free-falling game area that changes a lot as you advance. 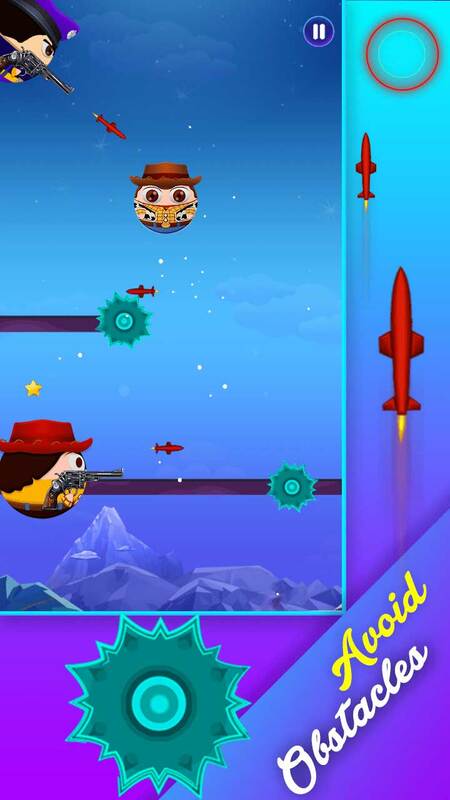 Single, double or even triple jump over cops, spikes, killer wheels and many other deadly obstacles. The slightest mistake and you have to start over. The goal in Drop Free is to try and advance as far as possible through a 50-level game and get the highest possible score. Invite your friends to see who’s better at Drop Free or see how you stand against other worldwide players. 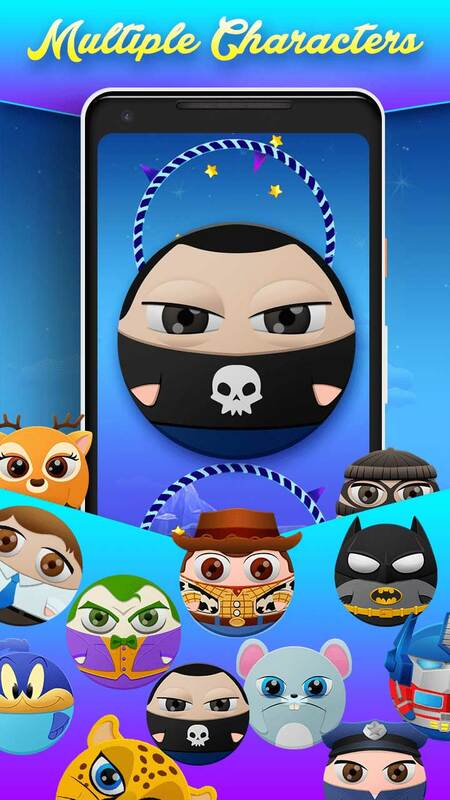 Use coins to unlock 19+ different characters, one more crazy than the next (but none more than the Joker). The controls are simple, tap once for a low jump, twice for a high jump and thrice for the jump of your life. The circles rotate in both directions and so does the path. TOP TIP: Always be ready and time your jumps, some obstacles require double or triple taps. 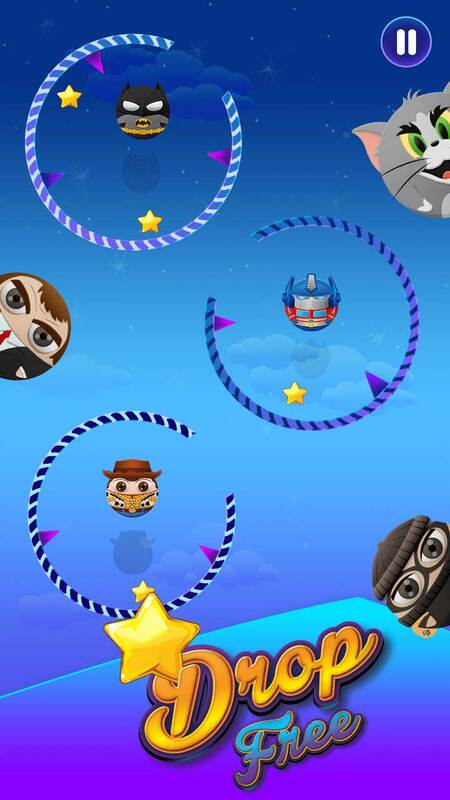 The speed of the obstacles and paths vary as the score increases so you will have a variety of gameplay. The aim is to collect as many stars as you can and use them to unlock some of your favorite characters. TOP TIP: If it doesn’t look like a star, its an obstacle. – Insane platformer gameplay. Drop Free features insane platformer gameplay. Your player drops continuously and you must adapt quickly in order to avoid all sorts of obstacles (rockets, spikes, bullets, etc). The goal is to collect as many coins as possible before being hit and starting over. – Dozens of levels. There are more than 50 different levels you must survive. Each level more devious than the last. Expect the unexpected with various pace changes, new types of obstacles, different layouts and more. Insanely addictive. – Unlock characters. As you successfully single/double or triple jump over obstacles, you’ll have the chance to collect in-game coins. Once you have enough you can unlock other characters to play with. From Prisoner to Batman (or Joker) there are over 19 different ones. – Beautiful graphics. Drop Free has a beautiful design with a cartoon-ish style and joyful dynamics. Accompanied by an upbeat soundtrack, you’re in for the perfect time killer game experience. – Leaderboards. Think you’re getting better at Drop Free? Then connect your Google Play Games account and access the worldwide leaderboards. Don’t feel discouraged, practice makes perfect. We’re UH Development, a London based indie game development studio, younger than a newborn baby. We are also a game publishing company, yes jack of all trades, master of …some. Our aim is to either capture the minds of gamers with insanely addictive games or just take up unnecessary storage on their phone (lol not really.) Drop Free stands as proof of our hard work. From its amazing graphics, character design and insane gameplay, each aspect of it was created and thoroughly optimized in-house. Follow UH Development on Facebook and Twitter for insight on future releases! This article was Published by Edamame Reviews, Written by UH Development LTD.